Thank you for showing interest in becoming a member of the Great Dane Club of Victoria. We welcome all people who own great Danes or have a passion or interest in our Breed. 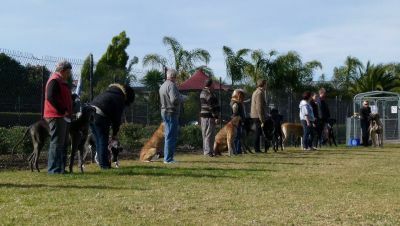 Our events are varied form Organizing "Fun Day" to holding Championship and Open Shows"
You do not need to have a Pedigree Great Dane or a Show Dog in order to become a member, all Great Dane lovers are more than welcome to join the club. DOGS Victoria Levy - Applies to Victorian residents who are not DOGS Victoria members. $8.00 (Per Person), $16.00 (Dual/Family). Club membership run from 1 July to 31 June each year. NOTE: You must be a member at the time your dog obtains it’s title to be eligible to obtain your free “title” sash donated by the GDCV.